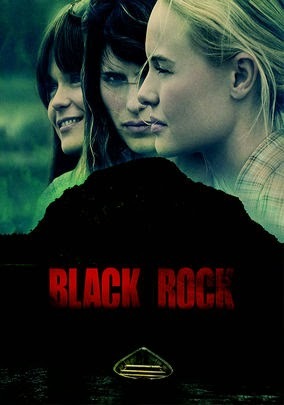 Black Rock is one of those rare films that was written by, directed by, and starring the same person. Back in the early days of film, this was common, but today it's rare. While I admire all the work a single person puts into such an effort, the truth is that most of these films turn out to be a little strange, Black Rock is no exception. Three life long best friends decide to reconnect on a weekend retreat, to a small secluded island, where they had a lot of childhood memories. Once there, they run into a pack of hunters. Testosterone and alcohol mix, leading to a vicious assault, leaving one group a member short, and the other group on the run. Katie Aselton is the Writer, Director, & star of this film and while I admire what she put into it, the truth is that it was very predictable and didn't make a whole lot of sense. First of all, these three women, as children were allowed to play on a secluded island in the middle of nowhere, without supervision? It also doesn't make sense that the hunters would be there, when there was seemingly no wildlife, and of course there had to be exactly three of them. Finally, why did three women, spending a weekend alone on a secluded island, bring enough alcohol to fuel a Todd Phillips movie? The whole thing was just a little too weird to be believable, and when you add how predictable this film was, it's just a recipe for disaster. The one thing I liked was the performance of Jay Paulson. He's usually a guy who gets bit parts and guest appearances here and there, but he was very solid and the most believable of the six characters. Aside from that this is a slow, painfully predictable, mess of a film, that really doesn't have a whole lot going for it.